Nearly 220,000 members of the National Union of Metalworkers of South Africa (NUMSA) began a nationwide strike on July 1 for better wages and working conditions. South African police fired rubber bullets this week to disperse striking members of the National Union of Metalworkers of South Africa (NUMSA), who were picketing outside a power station in the northern province of Limpopo. 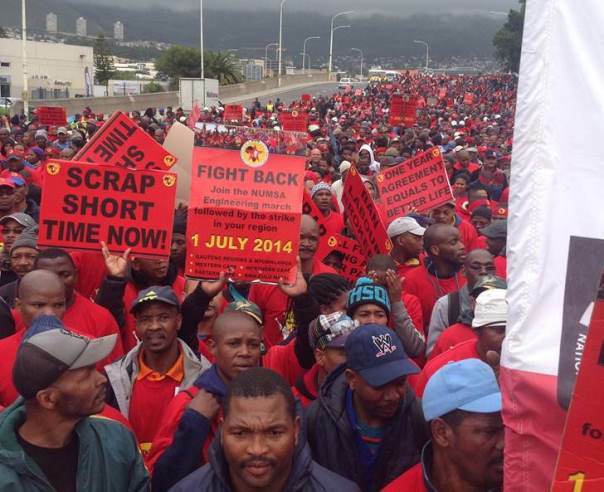 NUMSA is in the midst of a nationwide walkout over wages and working conditions that began on July 1 and involves more than 220,000 metal workers in the South African engineering sector. The strike is drawing global support from global labor federations, including IndustriALL, which represents nearly 50 million workers in 140 countries. Support for the NUMSA strikers is also growing in North America.